In May of 2006, four women of different religious affiliations met each other at Brenda Rosenberg’s interfaith project called “Reuniting the Children of Abraham” at Kirk in the Hills Presbyterian Church in Bloomfield Hills. These women came up with the idea to continue meeting in order to get to know each other’s stories. 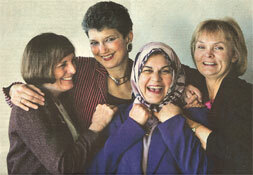 Gail Katz – a member of Congregation Beth Shalom in Oak Park at that time and former vice-president of the Jewish Community Relations Council, Shahina Begg – of the Unity Center Mosque in Bloomfield Hills, Peggy Kalis – of the Unity Church in Farmington Hills, and Trish Harris – of St. Hugo of the Hills in Bloomfield Hills, shared lunch, dinner, and had several coffee dates, planning a way to involve women of different faiths in a community-oriented project. With tensions in the Middle East, Iraq, and Darfur constantly in the news, these four women felt that communities of faith in Metro Detroit were becoming more and more segregated from each other. They felt that women had the capacity for empathy and connecting spiritually. The goal of their proposed interfaith event was to have women listen to each other, respect each other’s differences, and take action towards change. That project became the Women’s Interfaith Build with Habitat for Humanity on August 20th. Working in conjunction with Habitat For Humanity of Oakland County, about 55 Muslim, Catholic, Protestant, Jewish, and Baha’i women came together to put up siding, windows, and doors on two homes in Pontiac. The women began the day in the nearby park to share prayers for World Peace in the different faith traditions. They then went to work under the expert guidance of Gwen Joseph, Director of Corporate Relations and Special Events for Habitat for Humanity. Fifty-five women, who had never before installed siding, pounded nails, measured boards, handled power tools, or climbed up ladders, were amazed at how easy this manual labor turned out to be. At noon the women reassembled in the park to share personal information about themselves, find out what they all had in common, and come up with ideas as to how women of different faiths and cultures could build bridges of understanding in Metro Detroit. The day ended on a beautiful spiritual high. The sun came out, the skies turned blue, and Jewish, Christian, Muslim and Baha’i women ended this very special event with linked arms and a moment of silence, praying for peace after giving their time and energy building houses to help families in need. 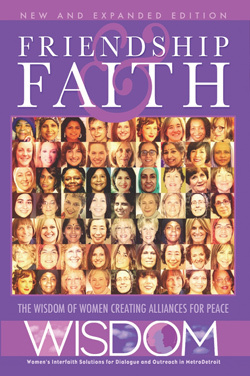 With tensions in the Middle East, Iraq, and Darfur constantly in the news, and with communities of faith in Metro Detroit becoming more and more segregated from each other, we want to empower Women’s Interfaith Solutions for Dialogue and Outreach in MetroDetroit to give women opportunities to listen to each other, respect each other’s differences, and take action towards change. We at WISDOM hope to establish venues for community service projects to help “repair the world,” while having the chance to dialogue with women of different faiths whom we don’t usually meet in our sheltered circle of friends and family. We also hope to arrange educational opportunities at our diverse places of worship to learn about each other’s religions with an empathy and spiritual energy that will strengthen friendships. We invite you to join our journeys towards celebrating Detroit’s religious diversity.